Detroit Police Athletic League (PAL) is thrilled to announce the public grand opening of their newest Corktown headquarters and stadium on Saturday, March 24, 2018. 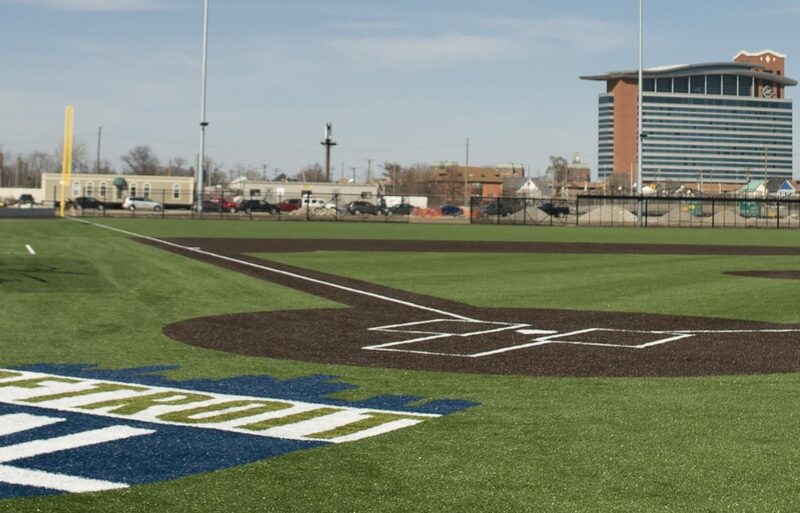 The brand-new facility, officially named The Corner Ballpark presented by Adient, will be open to the public at 9am and will celebrate the opening with a ribbon cutting ceremony at 10 a.m.
Fundraising for the development plans began in 2016, after the Detroit Economic Development Corp. approved a memorandum of understanding, granting PAL rights to the 9.5-acre field. In two years, PAL secured over $20 million in donor gifts to construct the 8,500 sq. foot headquarters and banquet hall, and build a state-of-the-art baseball field, which maintained the original dimensions of the former field. The site’s construction was led by Tooles-Roncelli, a joint venture between local commercial development firms Tooles Contracting Group LLC and Roncelli Inc.
PAL’s largest donors at the campaign’s MVP Level ($750K or larger contribution) include Adient, with naming rights to the stadium; Meijer, with naming rights to the Willie Horton Field of Dreams; Bank of America; Cinnaire; The Vera and Joseph Dresner Foundation; Ralph C. Wilson Jr. Foundation; The Old Tiger Conservancy; The Kresge Foundation; The Skillman Foundation; The W.K. Kellogg Foundation; and The William Davidson Foundation. PAL will recognize over 100 donors with an official unveiling of their donor wall on Friday, March 23 at 8:30 a.m. at the stadium entrance. The wall, designed by Erik and Israel Nordin, owners of The Detroit Design Center with consultation from the Michigan Sports Legacy Conservancy (MSLC), was artistically developed to acknowledge the fundraising campaign’s valuable contributors. The MSLC also collaborated with local designer MRA Mobile Experiential to build two historical showcases at the stadium which will highlight the significance of the site with photos, images, and interactive displays. The ribbon cutting ceremony will begin on the field at 10 a.m. and will be feature speeches from PAL supporters and community leaders, including Richey, Mayor Mike Duggan, Chief James Craig and former Senator Carl Levin. Detroit PAL will also will also announce recent gifts from Kar’s Nuts and the Baseball Tomorrow Fund, who’s support helped PAL cross their fundraising finish line. After the ceremony, guests will be able to tour the new facility and field, enjoy family-friendly activities, and watch baseball games between local Metro Detroit high school teams. Celebrations for the new stadium will begin on Friday, March 23 with the unveiling of the donor wall and an invite-only MVP dinner, celebrating PAL supporters that evening. An Afterglow party will take place after the dinner from 9 p.m. – 12 a.m. with tickets available for purchase ($75) at www.detroitpal.org. Detroit PAL is a non-profit organization positively impacting the lives of more than 14,000 children each year. With roots dating back to 1969, our group works to create safe and supportive places for kids to play. We also train and certify more than 1,700 volunteers each year to become encouraging coaches and mentors to the city’s youth. In partnership with the Detroit Police Department and community volunteers, Detroit PAL builds character in young people through athletic, academic and leadership development programs. We strive to achieve four important goals for our kids: Young people with high character, Young people who lead active and healthy lifestyles, Young people who give back in their community, Young people with positive relationships with police officers. For more information, please visit www.detroitpal.org.